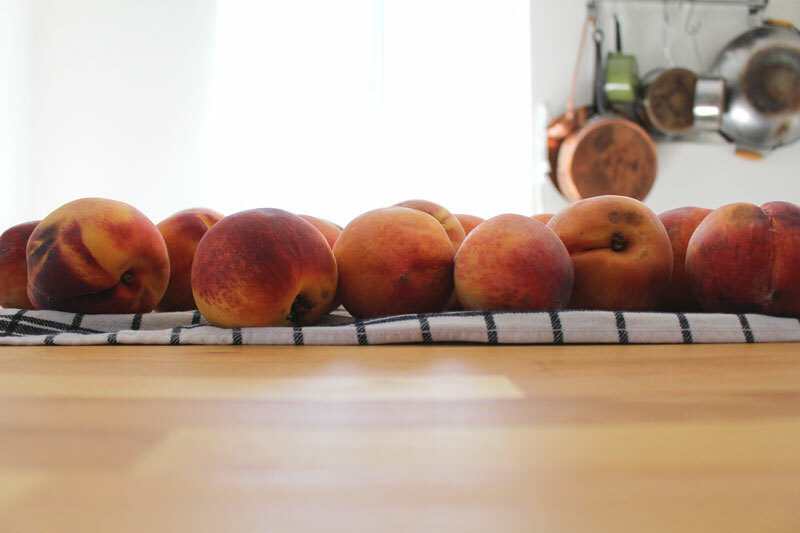 Last week I ordered twenty pounds of peaches as an add on from Abundant Harvest Organics. I thought I’d bitten off more than I could chew (haha, no pun intended) and worried that they may spoil before I got to them. 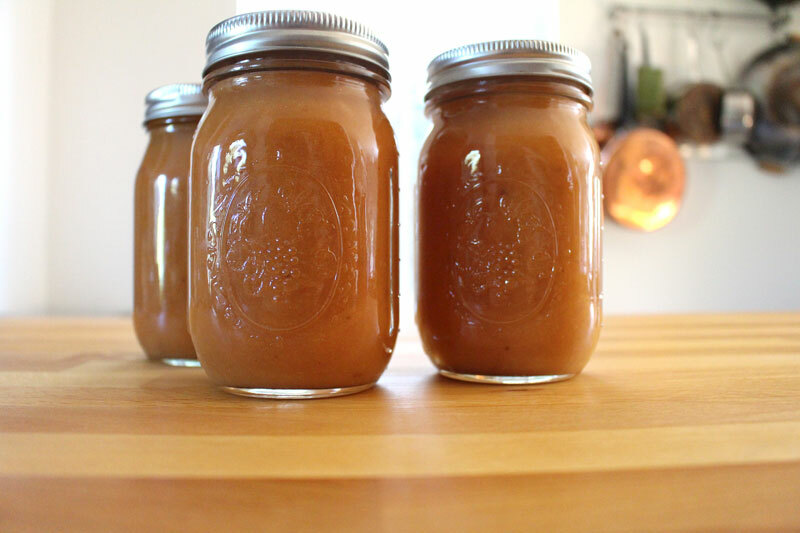 And now I have a yummy peach sauce to share with you! Feel free to substitute your favorite stone fruit if you’d like. 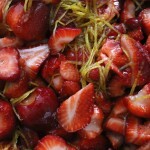 Plums, nectarines, apriums, pluots, apricots… they’d all be amazing. 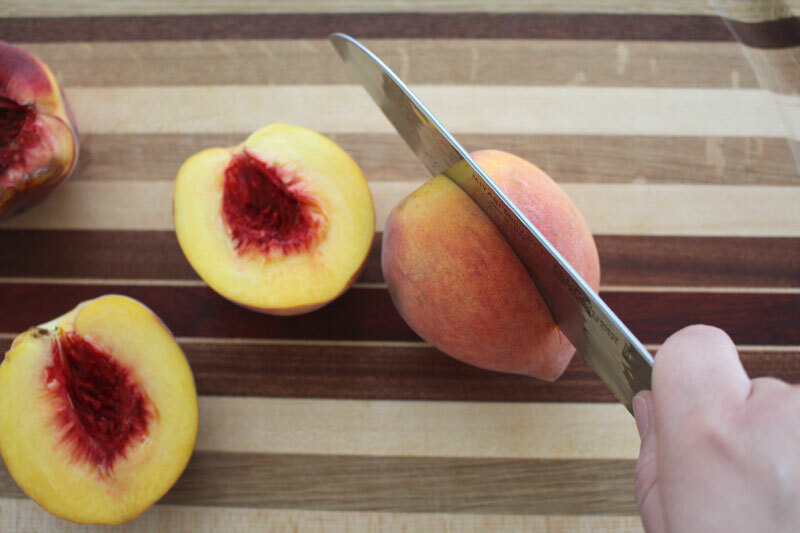 Start by halving the peaches. 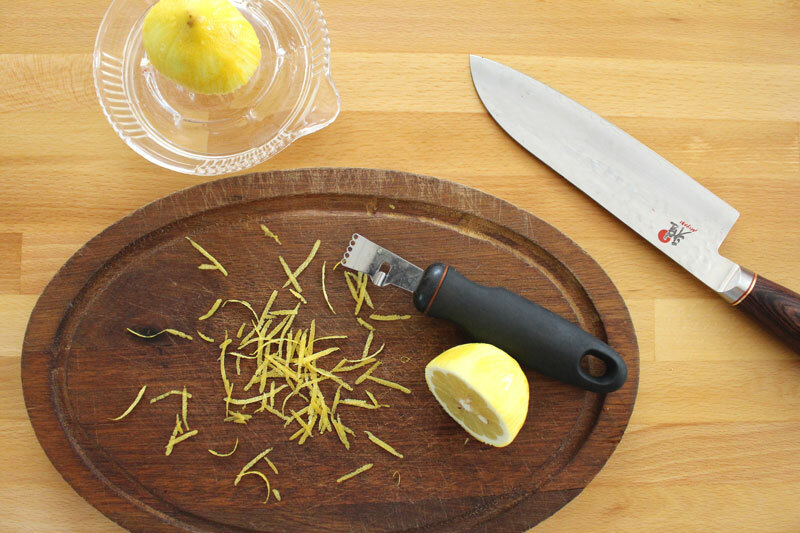 Remove the pit, and slice or roughly chop. It’s going to be blended in a bit, so don’t worry about the shape. About eight to ten cups will do just fine. 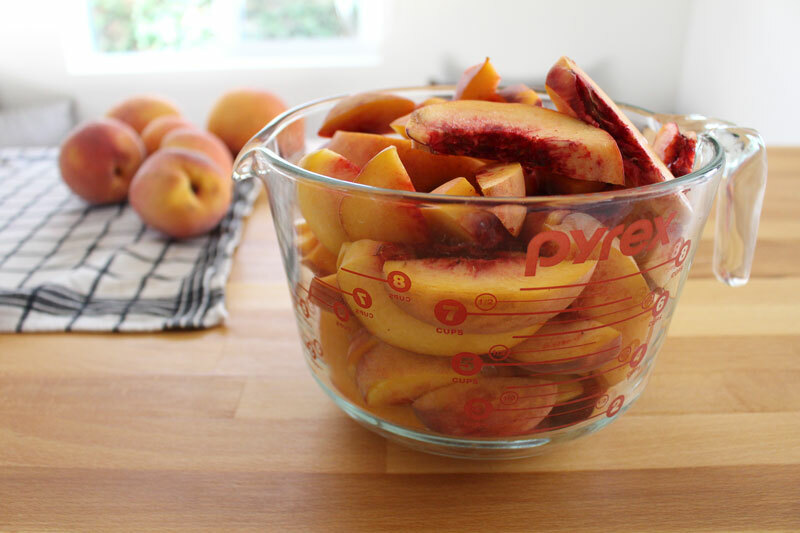 Out of my twenty pounds of peaches, I ended up with roughly 45 cups of sliced peaches in total. This sauce was just a small portion (I froze the rest – more about that another week). I added two tablespoons of butter to a large hot pot. If you don’t want to use butter, coconut oil would be just fine. 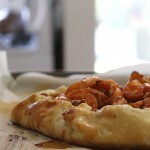 The fat adds a rich quality to the sauce that I love. If you don’t want to add either, that’s cool too. 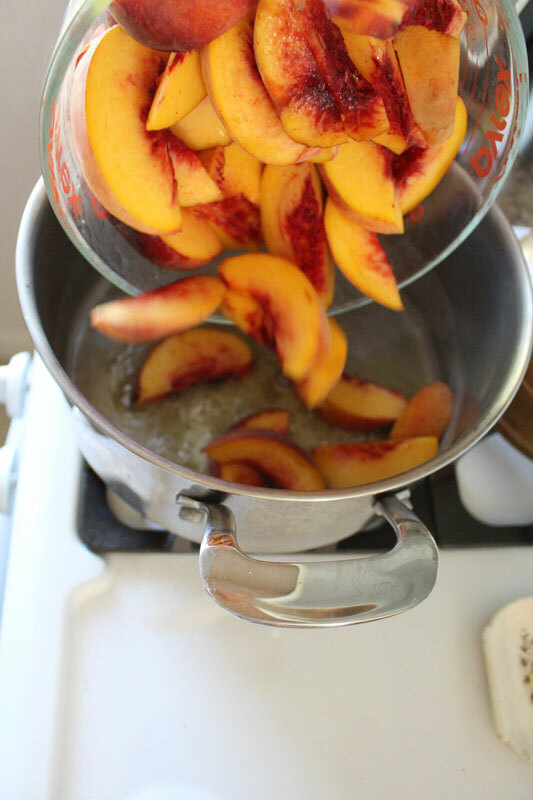 Peaches are dumped into the hot browning butter. Get ready for the smell. It’s amazing! After the peaches have cooked for about twenty minutes (and then rested for ten – not a must, I just needed more time to work on a different recipe, so they had to wait), they should look something like this. I had a few oranges still hanging around from spring boxes (wow they lasted a long time!! ), so I whisked them up with the zest and juice from one lemon, a bit of coconut palm sugar, and a pinch of salt. 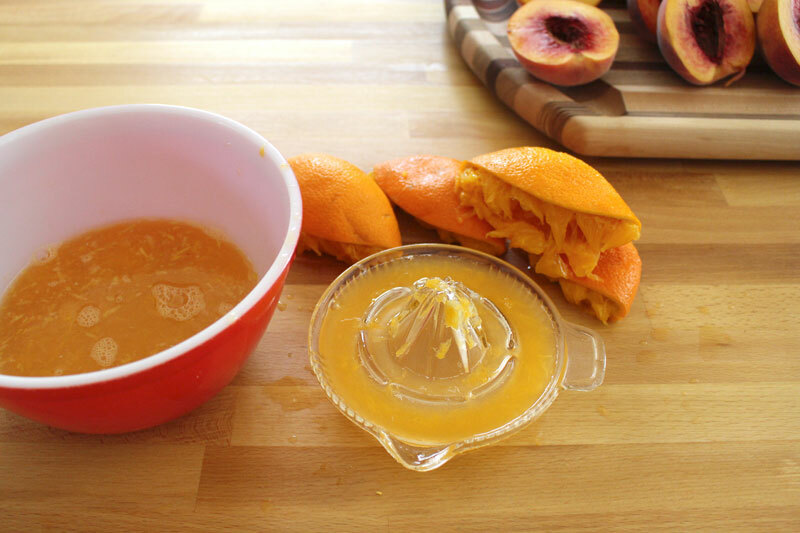 And then, orangy-lemon juice meet smooshy peaches. Orangeyou glad I didn’t say… I don’t know… banana?! After the sauce cooks up for a while longer, I blended it up with my hand blender. A regular blender will work just fine too (just be sure to remove the middle part of the lid and cover the hole with a clean kitchen towel). 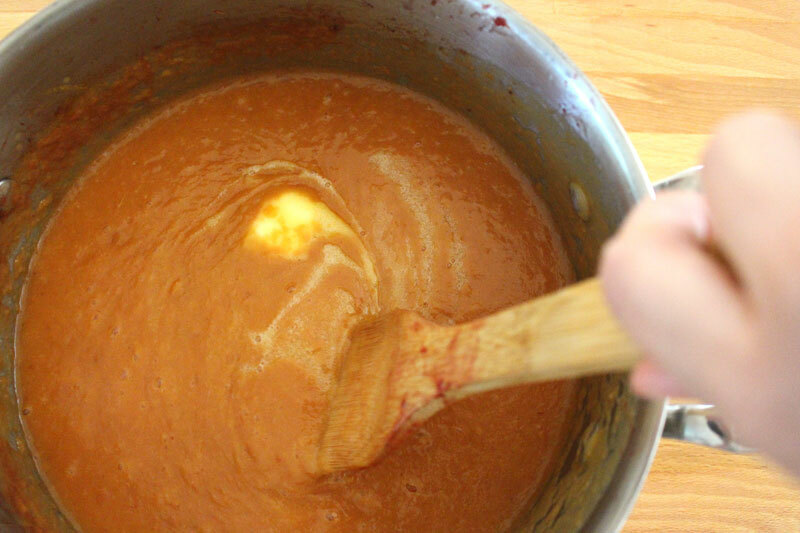 One more tablespoon of butter is stirred in after the sauce is blended. This is gonna be good… I’m hoping that Tim will make some more Vanilla Bean Ice Cream so I can top it with some of this sauce. You could make this even more awesome by roasting some fruit to plomp on top. 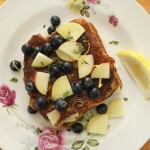 It would be great over French Toast or Cornmeal Pancakes, or used in place of jam. 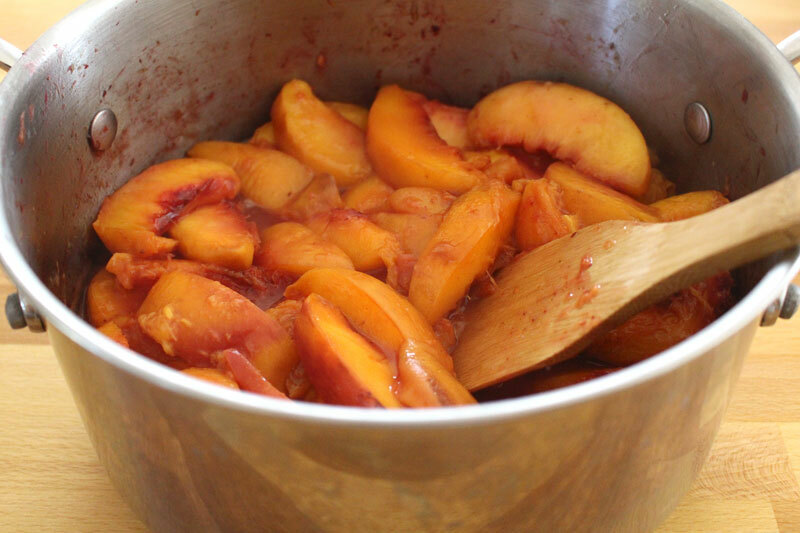 Sweet summer peaches are cooked up in butter and blended to make a delicious sauce. 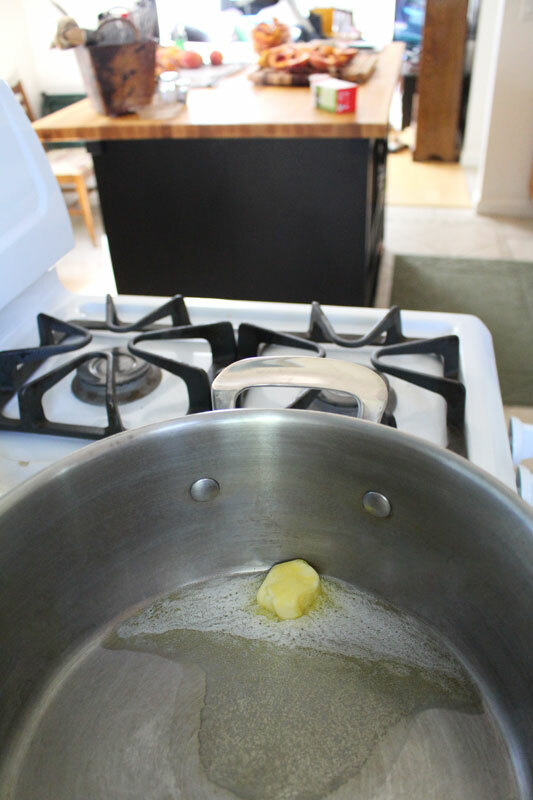 Heat a large pot and add 2 T of butter. When butter is hot, add peaches. 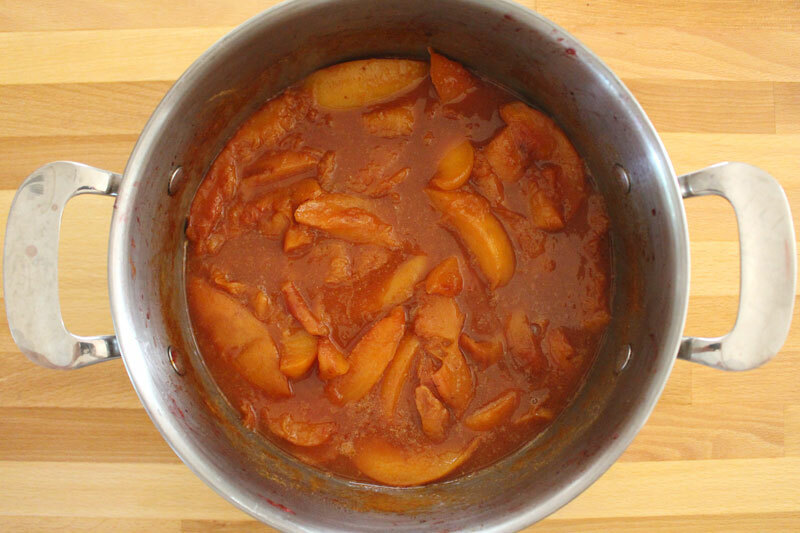 Cook over medium-low heat, stirring occasionally, for 20 minutes, or until peaches are very soft. Let stand 10 minutes (optional). Whisk together vanilla through sugar. Add to peaches. Bring to a boil. Reduce to a simmer and cook for 20 minutes. 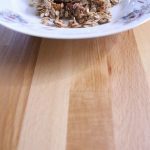 Blend with a hand blender (it helps to tip the pot to the side a bit to prevent splattering) or a blender (in batches, with the middle part of the lid removed and a clean towel covering the hole). Stir in remaining 1 T of butter. 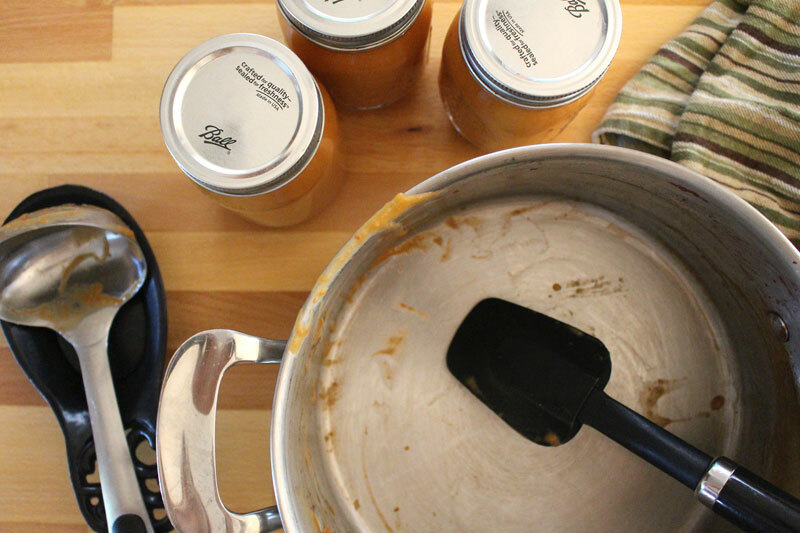 To store, ladle into clean pint jars, leaving at least ½" room at the top. You can either store in the freezer, or on the pantry shelf if using sterilized jars that have been processed as needed. If I were to can this, water bath canning maybe? Process for 20 minutes, most likely. It looks amazing, and I have a bushel of peaches, fresh from the orchard to play with!